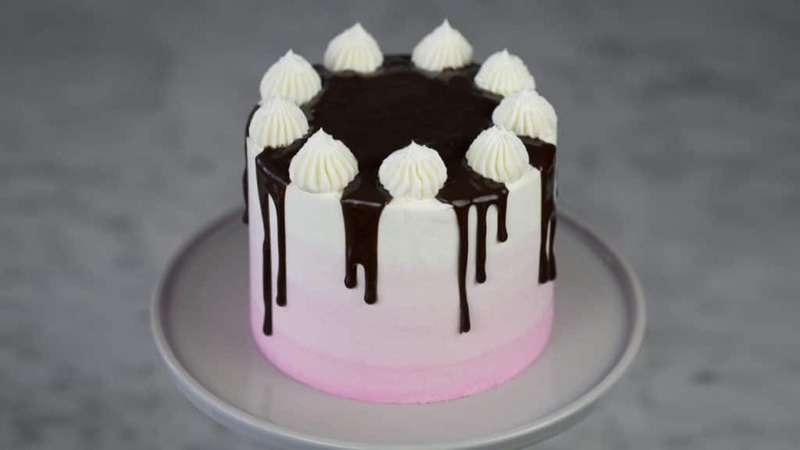 Here’s my Neapolitan cake! I almost kept that crumb coat but I REALLY wanted to try a pink ombré fading to contrast the white with a dark chocolate drip on top. I had hoped the cake would have all of the Neapolitan colors in an unexpected configuration! 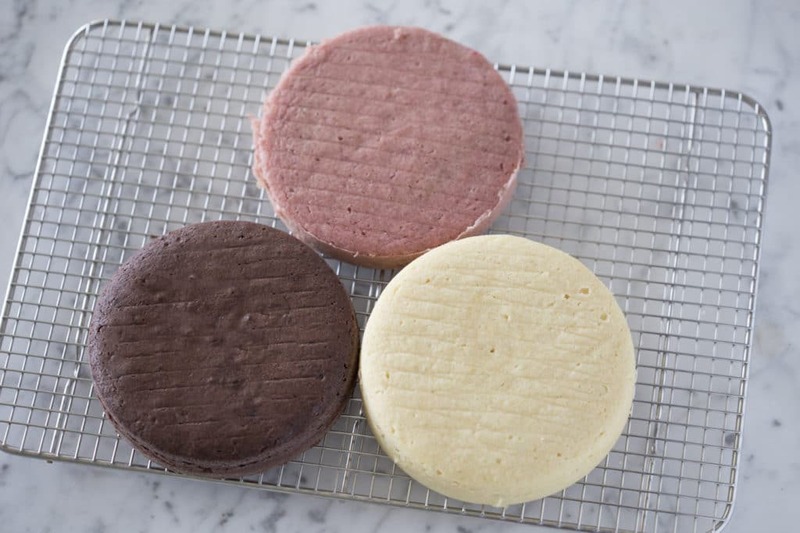 Each layer will bake for a different amount of time with the strawberry layer taking the most. 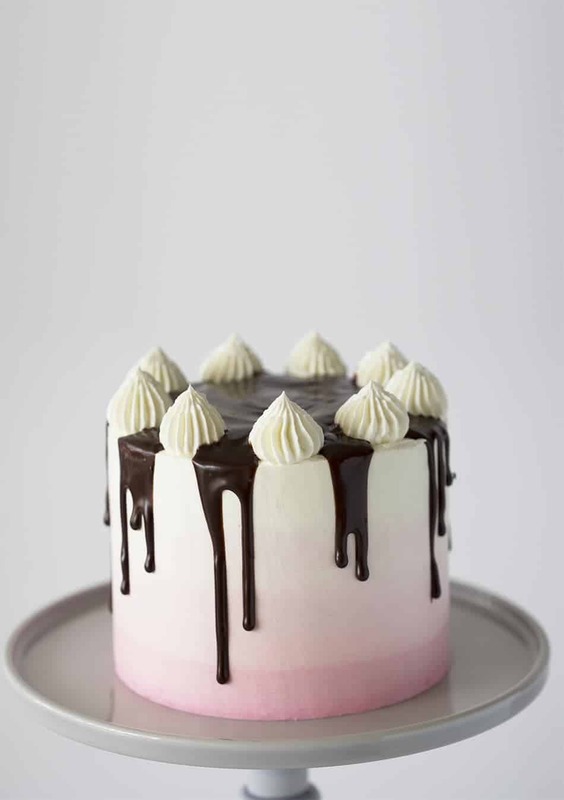 Test the consistency of your ganache by adding a drip onto a vertical surface like a plate held upright. It it’s too thick add a bit of cream and heat the mixture. A delicious, beautiful cake with chocolate, vanilla and strawberry layers covered in a creamy Italian meringue buttercream. Add the strawberry reduction to a separate bowl and mix. Bake at 350 for about 30 minutes or until the centers are springy to the touch. In a medium saucepan add the sugar and 1/4 cup of water then place on low heat. Increase to medium high heat stirring until temperature reads 235F. Drizzle the sugar into the mixer. Divide Buttercream into 5-6 equal batches. Create a gradient by adding food coloring to various amount to each batch. Leave 1 batch white for the dollops, piped with an 869 tip. In a stand mixer, beat the butter for approximately 5 minutes on high. Reduce speed to medium/low and slowly add in confection sugar, vanilla, and heavy cream. Divide mixture in half. Beat in cocoa powder into one-half. Mix cream into the melted and cooled chocolate. Transfer into the piping bag right before use. 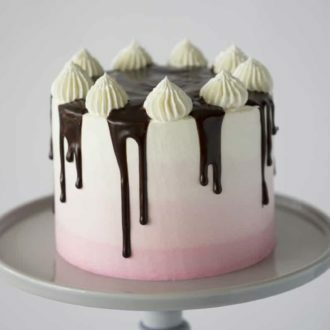 Test the consistency of your ganache by adding a drip onto a vertical surface like a plate held upright. It it's too thick add a bit of cream and heat the mixture. 6 oz of strawberries sliced, reduced and strained. In a medium saucepan add the sugar and water then place on low heat. Stir constantly until sugar melts and becomes clear. Fair to medium high heat stirring until temperature reads 235F. Drizzle the sugar into the mixer. Run mixer until merengue is body temperature. Add room temperature butter into running mixer one piece at a time. Beat until butter is combined and mixture has reached a silky consistency. Hi! I love this. My cousin’s birthday is coming up and I thought this would be the perfect cake for her! I do have a question, do you drizzle the sugar right away, while it’s still hot? The chocolate on top is a ganache. So that’s basically dark chocolate melted with cream. And you’re going to want to drizzle it while it’s warm. I put my cake in the fridge for a bit first to the buttercream doesn’t melt by the warm chocolate. Hope this helps!! If you’re asking about drizzling the sugar into the egg whites for the buttercream, yes, add it right away, straight from the heat. The hot syrup is what will warm the egg whites to a safe temperature and produce a silky, shiny meringue. AH! Of course. I edited the post accordingly. Thanks! I want to see what the inside looks like. Pleas post a picture of this cake with a slide taken out. I’m so sorry! I made this cake for a friend and didn’t want to cut it open before I handed it over. For the buttercream, how much water should be added? Just getting ready to make this and I see add sugar and water to the saucepan, but not the amount of water. Am I missing it somewhere? Thank you! Hi Lori — it requires a 1/4 cup. Hope that helps, John. Hi Sarah — I’m sorry that the Ombré Neapolitan Cake did not turn out the way you hoped. Moving forward I will try to make my directions more explicit and direct. 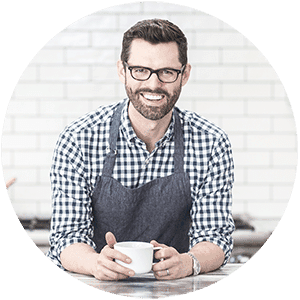 Please let me know how future recipes work out! Hi there. So excited to try this! I’m hoping to make it for a friend too. I have to travel and stay at a hotel over night first though. Could I make it all and decorate it at home then transport it in a cooler? And maybe ask the hotel to refrigerate it over night? Won’t really be able to finish it at my friend’s on the day. Hi Caz — Yes, you can make it in advance BUT it is not ideal. I find that refrigerated cakes taste stale. If the choice is between a cooler — or a hotel refrigerator — I would say the latter of the two. Hope that helps. Best, John. Hi! I’m a bit comfused about the recipe. Is one batch of buttercream enough for the filling and icing? What did you use for the chocolate filling? And how much each color buttercream do you need? Anyhow, that’s one beautiful cake! Hi Nina — I just updated the recipe. Hope the new instructions are more helpful. Thank you so much! Best, John. I am planning on making this cake this weekend but I just noticed that I don’t have any 6 inch tins. Could thus be modified for 8 inch tins? Amy advice? I would at least double the recipe! If you triple it, you’ll have extra to make cupcakes! Добрый день. А можно узнать объем формы в которой вы выпекаете бисквит? I used 6-inch cake pans for this recipe! Hope that helps! Hello John, My 3 years old daughter liked this cake and l try to make this for her birthday. In the YouTube video, what did you put on the strawberry cake? Pink filling or pink butter cream? According to the recipe of the filling, it seems there’s 2 kind of flavored filling, chocolate and vanilla. So is it pink buttercream? Do I need to divide the filling mixture in 3 and add the pink color in one of them?